While English is the official language, Ugandans as small children first learn to speak one of more than forty native tongues that fall into four families: Bantu, Nilotic, Central Sudanic, Kuliak. Among the four, more people speak a variety of Bantu and the Luganda language is the largest within the Bantu group. Moreover, Luganda is the dominant language in central Uganda where Kampala, the capital is located and where I am stationed as a volunteer. Although educated people speak English, Luganda is the language one hears on the streets, in taxis, in restaurants - that the ordinary speech of people. Here television station programs are in either English or Luganda and there is a healthy English and Luganda press. 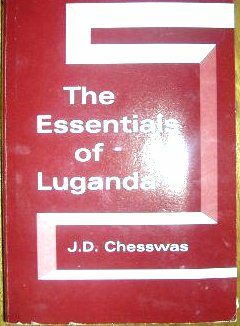 All that I might ever want to know about Luganda, and then some. So, upon arriving I decided to try to learn Luganda, at least enough to order dinner, ask directions and shop. This has been a more difficult task than I thought as both the vocabulary and word structure are quite different than English and European languages. For example, there are at least eight noun classes in Luganda, each with its own rules for forming plurals and adjectival agreement. Furthermore, while in English we tend to add suffixes such as making the plural or regular nouns when we add s, in Luganda one adds at the front of the noun to make plurals and for other reasons. A good example of all this is from class one nouns which designate people (although not all people are in class one). Using the root for person, ntu, one creates the singular by adding omu getting omuntu, person; using the plural prefix, aba, one gets abantu, people. Similarly the root for girl is wala yielding omuwala, girl, and abawala, girls. According to my teacher, other noun classes use different prefixes, making my head spin. There are many other complications that make learning Luganda difficult but not impossible. But the little I have mastered has gotten a smile from some locals and respect on a bus ride recently when I was able to state where I was going and ask the bus to stop when I arrived. And I leave with this simple exchange: question: Obulamu? (How’s life) Answer: Bulungi (fine). Ok, so my question to you, Ira, obulamu ? Sounds like a difficult language to learn ! I'm loving these blog posts ! I really love imagining you on a bus in Uganda, being able to state where you are going and asking the bus to stop when you arrive...in Luganda! I am curious about what the robust press is publishing and how it is distributed.